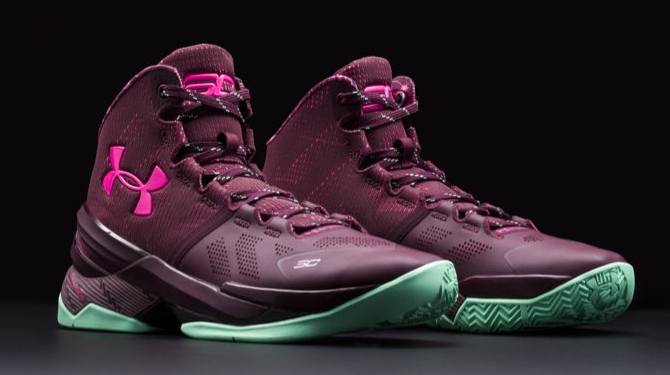 UA brings a new take on Black History Month with this primarily maroon Under Armour Curry Two ‘BHM’. The shoe is notable for being the colorway Steph Curry rocked when the Warriors blew out the Cavaliers by 34 points, led by Curry’s 35 points. The shoe features flamboyantly named colors like Dark Maroon on the upper, Antifreeze Green on the outsole, and Mojo Pink on the SC and UA brand logos. much better than any nike bhm’s this year. Love that maroon.